The Beauty Diet: Eat Your Way To A Fab New You is a detailed guide that helps women use the right kind of nutrition as a way of turning fitter and more fabulous than their regular selves. It seeks to redefine the entire concept of nutrition by offering a fresh perspective on food. In the form of tried-and-tested diet techniques, the author offers much sought-after advice to women of all age groups, helping them delay aging and reveal stunning new looks. She offers tips to cleanse the body using a basic detox and dispose unsightly flab from the tummy, thighs, and arms. She also offers tips that can help improve dental health, bring lustre to hair, and make ones skin radiant. Sabherwal introduces ways in which readers can use food to control their mood swings and maintain a positive temperament. She also presents techniques that can help them look younger, plainly by eating the right kind of food. The book is peppered with diet charts, illustrations, cooking techniques, and recipes. It also includes real life accounts of numerous celebrities about their varied experiences with nutrition and health. 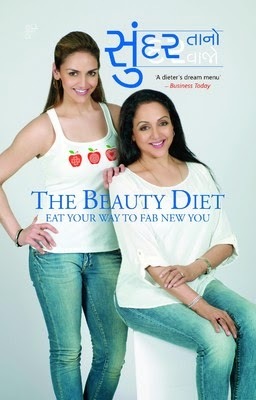 The Beauty Diet: Eat Your Way To A Fab New You was published in 2012 by Random House India. Shonali Sabherwal is an Indian nutrition consultant and chef who has the distinction of pioneering macrobiotic nutrition in India. The Beauty Diet: Eat Your Way To A Fab New You is her debut book and her only one as of July 2012. She holds a degree from Kushi Institute in the United States. Her fathers tryst with cancer convinced her to look for alternative sources of nutrition- ones that would work directly on the blood system and restore the natural balance between ones body and mind. Her subsequent research led her to embrace the philosophy of macrobiotics, which is known to improve and invigorate health from within. Her work as a nutrition consultant has been featured in numerous prominent publications such as Elle, DNA, The Times Of India, and Hindustan Times. It has even earned her several celebrity clients like Chitrangadha Singh, Raima Sen, Hema Malini, Katrina Kaif, and Shekhar Kapur. Sabherwal also has her own line of ready-to-eat products that are organic, vegetarian, dairy-free, and gluten-free. They are available under the brand name, Soulfood. She lives in Mumbai.